HRH, the Duke of Cambridge addresses attendees at the Tusk Conservation Awards before honoring John Kahekwa for his work in the Democratic Republic of Congo. 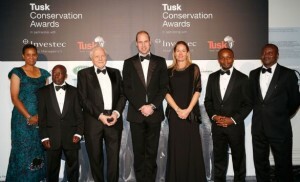 HRH, the Duke of Cambridge handed the prestigious Prince William Award for Conservation in Africa 2016 to John Kahekwa at the Tusk Conservation Awards in London, at the Victoria and Albert Museum. We at ElephantRescue.net congratulate John and are doubly proud, and fortunate, to have him as a member of our board. The Tusk Conservation Awards press release stated that, “this event gives us a chance to celebrate extraordinary people, whose work and lives might otherwise go unnoticed outside their fields. Their work with wildlife and communities in Africa safeguards the future for us all. 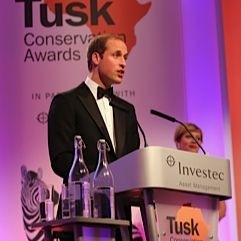 “HRH the Duke of Cambridge presented the Prince William Award, and Sir David Attenborough presented the Tusk Conservation and Wildlife Ranger awards. Sir David also received a special award from the Duke, for a lifetime of service to conservation. 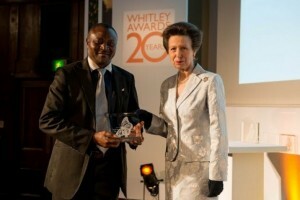 Earlier last year, Mr. Kahekwa was also presented the Whitley Award from HRH, the Princess Royal. Sir David Attenborough narrates a beautiful film about the Whitley Award, which we highly recommend. Watch it by clicking here. In addition to the Whitley Award and the Prince William Award for Conservation in Africa, John has received several other prestigious awards for his work including the Marsh Award and is a three time recipient of the Medal of Merit for Ecology and Gorilla Protection. HRH with our board member, John Kahekwa, at his far left. 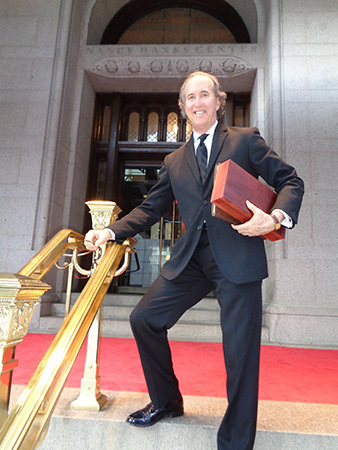 Hathaway enters a meeting at the Trump International Hotel in Washington, DC to discuss water infrastructure which will effect the world’s largest elephant herds. It’s certainly exhilarating to travel to Africa. This is why we do all we can to encourage tourism and, in fact, will plan group trips in the near future to several African countries for our donors. However, such trips for business are time consuming, expensive and often less is accomplished to help elephants during these trips than in meetings in the United States. This is why we are focusing on a big picture strategy: policy making, water infrastructure problems, reforestation and herd management, all of which effect the world’s largest elephant herds. These crucial issues can sometimes be resolved by phone calls, writing influential articles, developing relationships with key decision maker and meetings with ambassadors of African countries in Washington, DC, thereby greatly reducing time and travel expenses. This is what we describe as the macro vision – our big picture strategy. Yet, at the same time, on the micro level, we will always answer the call to rescue only one elephant no matter where he or she may be in the world. Indeed, we are presently working very hard to rescue one beautiful little forest elephant from the Abidjan Zoo in the Ivory Coast and, although it will require much time and hard work, we are confident we will succeed. 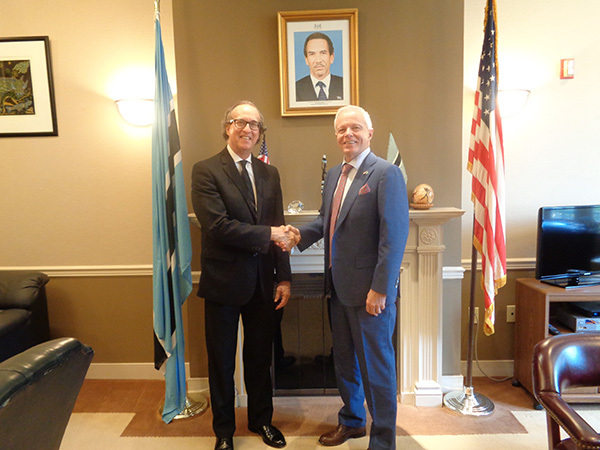 Hathaway shaking hands with the Ambassador of Botswana at the Botswana Embassy in Washington, DC. 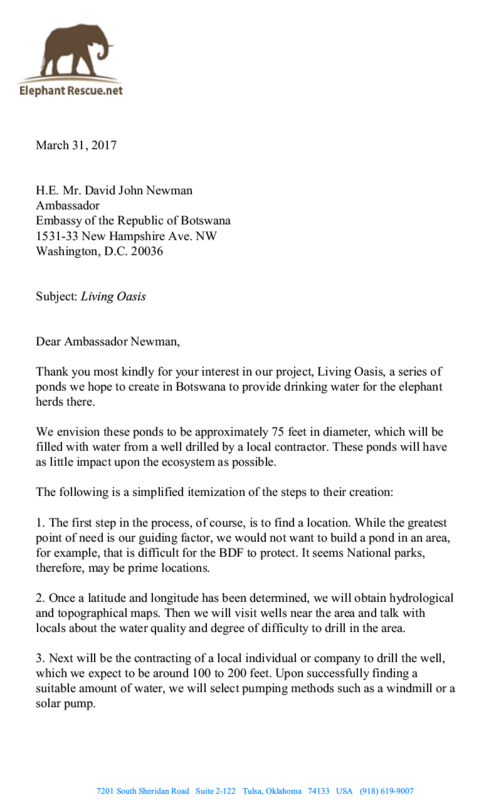 The founder of ElephantRescue.net, Phillip Hathaway, was received by the Ambassador of the Republic of Botswana at the Washington, DC embassy last week. As a symbol of his esteem for His Excellency, the President, Ambassador Newman and the people of Botswana, Hathaway presented the ambassador with a replica of George Washington’s pistol tastefully encased in an attractive wooden box. During the hour-long meeting, they discussed many issues effecting the estimated 160,000 elephants who live in the desert region of Botswana, especially water availability, reforestation and herd management. Hathaway said, “It was an honor to meet the ambassador who represents His Excellency, the President and the wonderful people of Botswana. Hardly a day goes by in which I don’t say, thank God for Botswana. For if not for Botswana, I would have no hope for the survival of the African elephant. The Botswana Defense Force protects them and no hunting is allowed. This free, fully illustrated online magazine is an expose of the multi-billion dollar zoo industry, which confirms shocking facts about “surplus” animals – some of whom are babies – who are perfectly healthy yet are killed for convenience by zoos. Supported by thirty-eight references, this twenty-four page magazine is essential for those who care about animals. ElephantRescue.net has launched a new division. Its mission is – We advocate transforming zoos into wild bird sanctuaries. ZoosAreForTheBirds.org is both a figurative and literal expression of our desire to keep animals from being imprisoned in zoos and, at the same time, providing much needed habitat for wild birds. 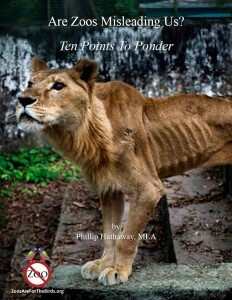 We invite everyone to visit our beautiful website and to read Phillip Hathaway’s free and fully illustrated publication, Are Zoos Misleading Us?, which is available on this exciting new site. Over 210,000 people sign our petition to save Can! 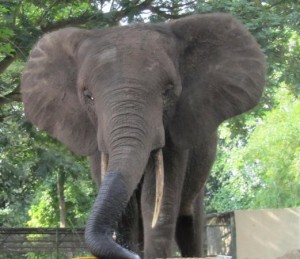 Three other forest elephants died at the Abidjan Zoo where some animals are starving. “First we noticed that some of the animals are starving and in bad shape. We saw a lonely elephant and its was sad.” These are the words of an eye-witness who visited the Abidjan Zoo in the war-torn Ivory Coast on January 29, 2016. Also, a German citizen and zoologist has visited CAN several times and describes her situation at the zoo as “unsustainable”. This is why we are delighted that our petition has been so well received. Over 210,000 people from around the world have signed it. But we will never leave the others behind without fighting for them, too. Along with CAN, we hope to rescue each and every one of the animals from that zoo. So, please go to our petition by clicking here and sign it today. CAN and all the animals at Abidjan thank you! Before reading the Estimated Administrative Costs to Rescue Can, I want to thank you most kindly for your generous gifts. Like you, I have made sacrifices, too, working without a salary or an expense account for 22 months, since November 2014 when I began devoting all my time to the elephant crisis. I have worked 7 days a week and take no breaks or vacations. I have no volunteers or fellow workers so I am stretched rather thin. Yet, I am thinking in long range goals, building an organization that will thrive 20 years, 30 years and further into the future thus, “Ensuring a safe, natural environment for all elephants,” which, of course, is our mission statement. Mindful of this, it is important to realize that this particular operation will take time. Long before the rescue takes place, we must make on site pre-rescue assessments, finalize arrangements in her new home and, lastly, satisfy the many legal and bureaucratic requirements, which will be our biggest and most time consuming challenge. And, please take special note that these figures are estimates only and may vary greatly. Yet, at the same time, we have presented these figures in good faith with the hope that they are realistic. 1. Vet Fees – estimated at $4,500. This will cover a basic medical check up and part of the travel expenses of the physician. We are hoping that the eminently qualified Dr. Will Fowlds (click here to visit him on twitter) will be the physician in charge of this rescue. 2. Medicine – estimated at $4,500. Included in this expense are essential preventative medication and the costs of eye serum for Can’s chronic eye infection. Tranquilization is also included, however, I want to keep this to an absolute minimum to avoid any adverse effects. I feel this will be quite possible since she is well accustomed to interactions with humans and, therefore, will likely walk with us willingly to the zoo gates to ground transport and, from ground transport, to air transport. We will take no chances of her slightest injury during her travel. 3. 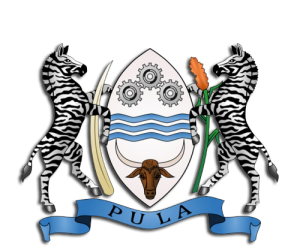 Ground and Air Transportation to the Republic of Botswana – $40,000. 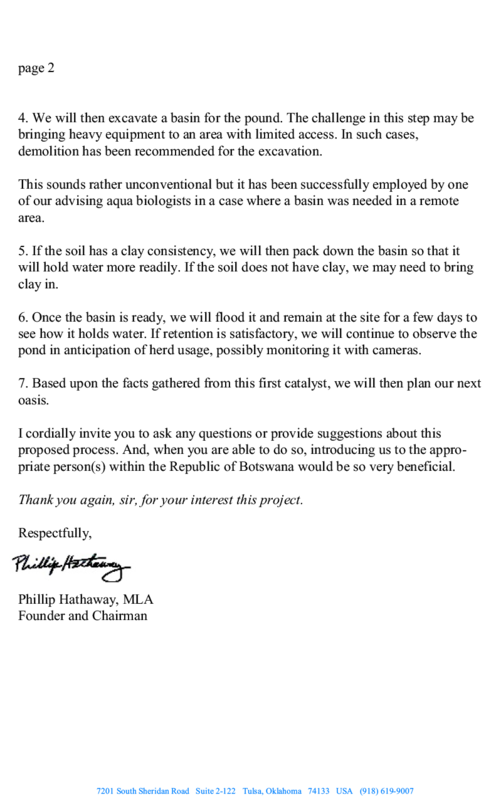 This estimate was suggested by one of my board members, Grant Fowlds (click here to read his bio) who is Director of the Amakhala Game Reserve in South Africa (Grant, by the way, is Dr. Will Fowlds’ brother). The spectacular, 19,000 acre Amakhala is a Big Five Game Reserve and home to rhino, lions, leopards, cheetah, impala, giraffes, buffalo and, of course, elephants. A herd of 24 elephants presently live there and their numbers will soon increase to around 40. In keeping with our mission of “Ensuring a safe, natural environment for all elephants,” hunting is forbidden there. As Director of the Amakhala, Grant has a unique depth of experience working with elephants and we are especially pleased that this includes transporting them on many occasions. 4. Basic Expenses for Rescue Team – $20,000. Pre-rescue evaluations include visits to the Abidjan Zoo, meetings with decision makers and logistical evaluations, particularly the best exit from the zoo and best route to the airport. The most critical objective of the pre-rescue visit, however, is a careful observation of Can’s health, her food and her living conditions. The rescue team of about four people will travel from South Africa and remain in Abidjan about two days. I will probably arrive early to ensure that ground transportation for Can and all other arrangements are in place prior to the arrival of the team so that we all tightly coordinated for a smooth, efficient and costs effective transport. 5. Legal Fees for Bureaucratic Red Tape and many other essential Administrative Costs – $21,000. Obtaining Can’s release from the zoo will be our single biggest challenge. Nevertheless, we are prepared. And, transporting an elephant from one country to another is closely scrutinized by the governments involved and by the Convention of International Treatise of Endangered Species (CITES). Lawfully complying with their many requirements can be time consuming and frustrating. One must remember “TIA” – this is Africa. Everything is difficult and takes a long time. Any donations not used for this rescue will be used for other expenses and administrative costs. Born in the Magaliesburg mountains in 1974, Grant Reed was raised with a love for birds, snakes and all things African, a passion passed on from his paternal grandfather and father. Grant’s run-in with snakes came earlier in life on his eighteenth birthday when he was bitten by a puff-adder and ended up spending six months in and out of hospital. Having survived hospital and the puff-adder bite Grant continues to be passionate about snakes and to this day he still lectures interested parties on snakes and snakebite. A consummate naturalist, Grant’s interests include such diverse subjects as dragonflies, birds, butterflies and wildflowers. He is widely considered to be one of Botswana’s top guides. Grant earned a Bachelor of Technology Degree from Pretoria Technikon, the FGASA (Field Guides Association of Southern Africa) Level III certificate and a several other specialist qualifications, which combined are similar to earning a Master’s Degree, or much more, in wildlife conservation. This, together with his practical, on-the-ground expertise, is truly invaluable to the mission of ElephantRescue.net. Grant is also a founding director of Letaka Safaris and of Okavango Guiding School. A large portion of his passionate energy is directed to the training and development of guides in Botswana. He lives outside Maun on the banks of the Thamalakane River with his wife Trudi and his sons, Merrick and Ross.